Part of the experience of visiting an art museum is squinting at those little plaques beside the artworks. As you know, they have a lot of information in tiny type: The artist’s name, when the work was done, what materials were used, and so on. It also includes the title of the work, which can often be helpful. Oh, if you’re looking at a painting of a baby in a stable you can probably guess the subject matter without looking at the title, but if you’re looking at a group of men wearing tights, it’s reasonable to wonder who the heck they are. Let’s say the plaque informs you that the title of this Velázquez painting is “The Surrender of Breda”. Unless your major was Spanish History, you may still wonder what you’re looking at, but at least you have a hint. It’s possible to surmise what the artist was intending to convey; how we, as viewers, are encouraged to see it. To put it another way, there’s a reason that Velázquez titled one of his other paintings “Philip IV on Horseback” and not “Paco the Horse with Some Guy Riding Him”. It’s primarily about the king, not his transportation. What I’m suggesting is that the title of a painting or sculpture can provide clues to what the artist was hoping to communicate, and it’s my view that art is — or should be — a way of expressing thoughts and emotions and experiences, a means of inviting the viewer to share the artist’s insight. That may have been easier to do when painting was representational. As noted before, in religious scenes or portraits of royalty, visual cues were supplied. In the era of abstract art, however, it’s more difficult to know what’s on the artist’s mind. That’s why it annoys me when the little plaque next to a canvas or sculpture says “Untitled”. Painters like Picasso and Miró, who were pioneers in the new style of art, still gave us titles. 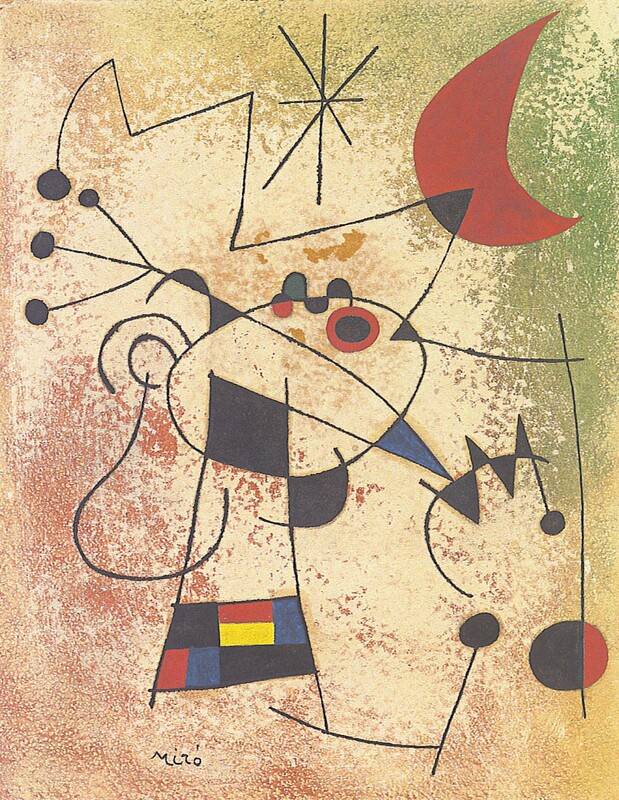 Some of them were doozies, too — Miró called one of his “The Lightning Bird Blinded by Moonfire” (see above). You’re not likely to look at it for five seconds and say, “Oh, sure, I get that,” but it at least gives you a point of departure. A Dream — Or Was It? Had he not lost almost five years to military service at the peak of his baseball career, Ted Williams’ batting statistics would have surpassed every player in history. That’s how the conversation goes with some fans, anyway, and they may have a point. In a similar vein, art lovers sometimes speculate that Diego Velázquez would be recognized as the world’s greatest painter if he hadn’t “sold out” and become court painter to King Philip IV of Spain. That argument is even more hypothetical than the one about Ted Williams, and it should be noted that a lot of artists and experts — including Manet and Picasso — already consider Velázquez to be the all-time best. You can’t help wondering, though, what he might have produced if he hadn’t taken the job with King Philip at the age of 24. Velázquez was born in 1599, and by his teens he was producing paintings of astonishing beauty; they were of everyday subjects, often with still-life elements. An outstanding example is The Waterseller of Seville, which has, among other masterstrokes, exquisitely rendered water condensation on the side of a foreground jug. 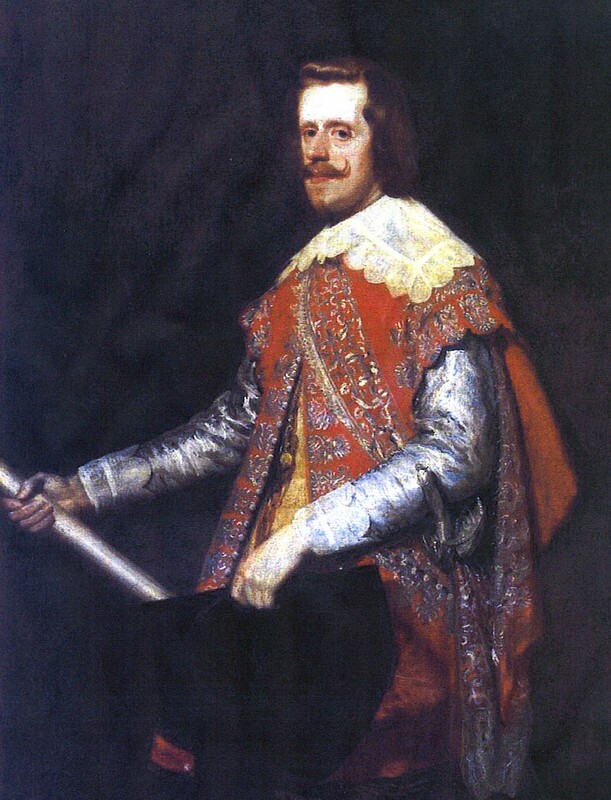 His skill caught the attention of one of the king’s ministers, and Velázquez was soon brought to Madrid. He was an ambitious young man, and when the king offered him the court-painter gig, Velázquez accepted the offer to be rich and famous. Hey, who wouldn’t? Velázquez accepted the challenge, though, churning out portraits of Philip in closeup, Philip full-length, Philip seated, Philip standing, Philip on horseback, and so on. We may look at the results now and say, “oh, dear”, but the king was delighted. That’s how bad it must have been — Philip found the likenesses flattering. He developed a friendship with Velázquez, and gave him additional responsibilities. Diego became an event organizer, furnished the royal apartments, and even handled the occasional diplomatic mission. In 1649 Velázquez was sent to Italy to buy some paintings for King Philip’s collection, and he scooped up some masterpieces that are now among the most important pieces in the Prado museum. While abroad, Velázquez also had the opportunity to paint the unforgettable portrait of Pope Innocent X, whose expression seems to be commanding you to kneel. The most famous picture Velázquez painted was almost his last. 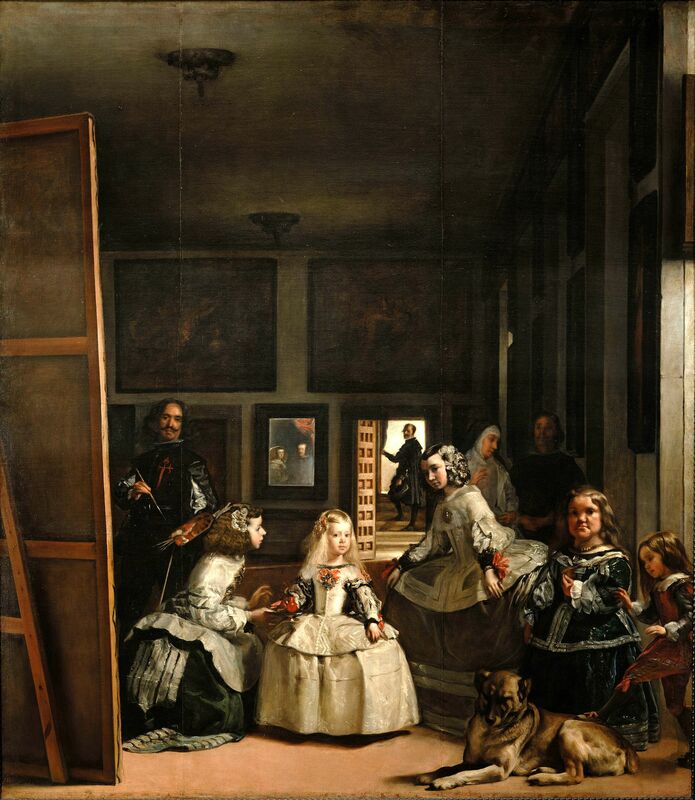 It’s now called Las Meninas (The Ladies-In-Waiting), although the picture centers on the Infanta Margarita, a little girl in a ridiculously large dress. As you study the painting, you notice that Velázquez has put himself in it, standing at his easel. The king and queen are reflected in a mirror on a back wall, as though they are posing for Velázquez at the spot where we are standing. If he hadn’t taken the job as Court Painter, we can only speculate what else Velázquez might have produced, but he certainly wouldn’t have been allowed to paint Las Meninas. Could he have gone on to paint even greater works? Who knows? It’s enough that he was among the best who ever lived. For that matter, so was Ted Williams.